There are a lot of choice when you deside you want an Akita to complete your family. Not only is there the choice between male or female, but there is a wide variëty of colors tho choose from. The colors we know are: Red, Brindle, Sesame and White. If we talk about the Red Akita, there are a lot of different shades of red to choose from. Some dogs do not have a vale red color and some dogs are a deep red color. 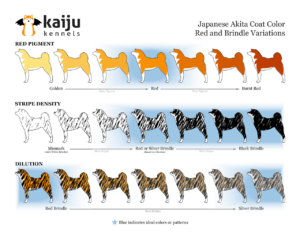 If we talk about the Brindle Akita, there are even more different shades and patterns. Some even say that the coat of a brindle Akita changes with every shedding. If we talk about the Sesame Akita, we talk about a red Akita with black on the tip of the hairs. Tipping is light and even on the body and head with no concentration of black in any area. Sesame areas appear at least one-half red. Sesame may end in a widow’s peak on the forehead, leaving the bridge and sides of the muzzle red. Well, you can probably guess what we talk about when we talk about the White Akita.